I submitted four entries to the Iowa State Fair’s photography competition, and heard back that one of the entries was not only accepted, it won an award. But I don’t know which picture, or what award. Over the weekend, there was an artists’ reception at the Iowa State Fair, where the winners were announced. Unfortunately, unless I made that trip to Des Moines last weekend to attend the awards ceremonies, I still don’t know which of my four pictures made the final cut. It feels like waiting for Christmas – starting in August. So I decided to play detective. I went through as many Facebook posts as I could, using the search term “2018 Iowa State Fair Photography” and hoped that someone had captured an image of the wall featuring their photo … but also including mine. And here’s what I did find out. Of 113 photos entered in the “Planes, Trains and Automobiles” category, 27 were accepted, 8 earned ribbons (first, second, third and five honorable mentions). My photo “No School Today, Brah” was entered in that category. Of 43 photos entered in the “Infrared, Toned, Tinted and Solarized” category, 18 were accepted, 6 earned ribbons (first, second, third and three honorable mentions). My photo “Infrared Horizon 787” was entered in that category. Of 89 photos entered in the “Sports” category, 28 were accepted, 7 earned ribbons (first, second, third and four honorable mentions). My photo “The Final Turn” (also known as “Mugshots Bro Leads the Way”) was entered in that category. Of 66 photos entered in the “Anything Goes” category, 20 were accepted, 8 earned ribbons (first, second, third and five honorable mentions). My photo “The AGFA Bridge Over Ansco Lake” was entered in that category. Eventually, I was able to find someone who had a copy of the photography book that’s produced by the Iowa State Fair every year, and she agreed to scan the winning entry page for me. 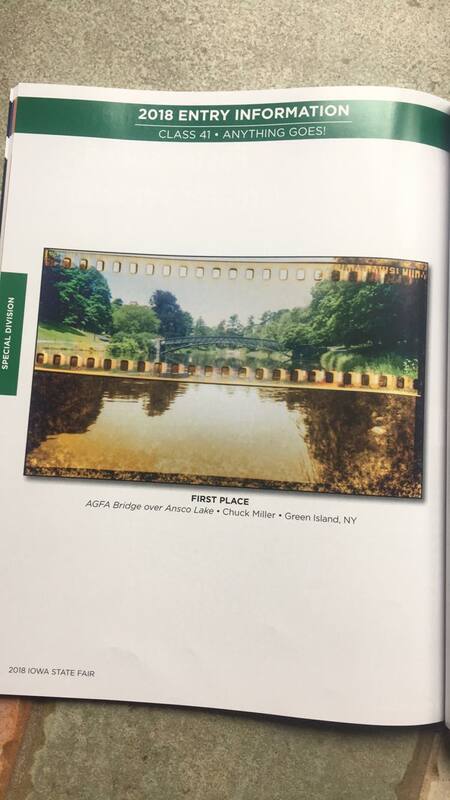 Holy splitfilm, Batman … The AGFA Bridge Over Ansco Lake, my experiment in shooting two films at once through a vintage camera – the photo that claimed “Best in Show” at the Durham Fair, as well as the only picture that I know of that won silks at both Altamont and Syracuse … just picked up another First Place Ribbon! My splitfilm photo beat 66 other entrants in a highly competitive category and took the blue silk. I’m still starting Competition Season with a blue ribbon. You’re in good company, Trump won in Iowa, too!